Live video streaming iOS app Periscope has gained a new feature that lets users save their broadcasts forever. Users of the Twitter-owned app are now able to permanently save replays of their videos simply by including the hashtag #save in the title, with the option remaining to delete the broadcast at a later time. The new feature puts it on a level footing with Facebook Live, which touts the same facility to make videos permanent. The new feature was announced last night via Periscope by CEO Kayvon Beykpour, who described the feature as a "public beta" and part of an upcoming "holistic solution" that will let users control how broadcasts stay on the platform, including when to keep broadcasts for longer than the default 24-hour window and when to have them deleted more quickly. Comments and hearts are saved with broadcasts that use the new #save hashtag and there is no limit to the number of videos a user can save. Broadcasts with the hashtag will be visible in a user's profile, as well as anywhere else they show up, while links shared externally such as via Twitter will remain permanently active. Periscope also bid a fond farewell to Katch, a third-party tool for saving Periscope videos and sharing them elsewhere. The startup shut down last month after running out of funding, reports TechCrunch. Periscope users need not update their app to see the change come into effect, but should instead sign up for the Periscope Beta Program. 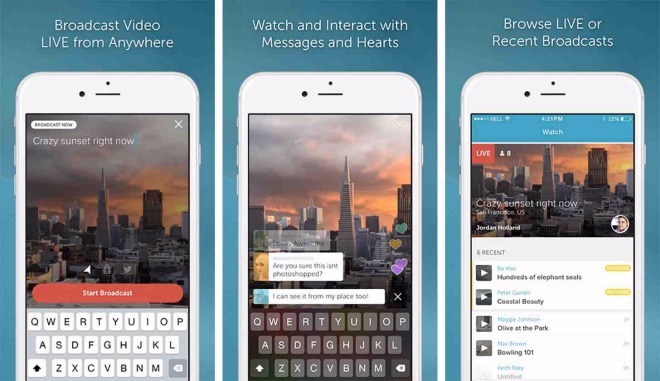 Periscope is a free download on the App Store available for iPhone and iPad. [Direct Link] A separate Apple TV app is also available on the Apple TV App Store. Um, as a random person in public, do I get a say if I don't want to be live broadcasted and permanently saved? Yes - you just have to not go outside.